The phrase in a literal sense implies a physical change, a deviation from normal ‘humanity’ due to simply ingesting an item of food repeatedly, but we know that the meaning is far more subtle: when you eat bad food, you’re going to have a bad body. Think of your body like your car, with an engine that needs fuel. If you were to put grungy, slimy, contaminated gasoline in your car’s tank once or twice, you’ll probably be OK. The car will likely handle it just fine; it’s the repeated fill ups with that grungy gasoline that will eventually start to do so much damage to the car’s engine that you will soon find yourself in the market for a new vehicle. Your mind is much the same, actually. What you feed it dictates how it runs, and that, in turn, affects the manner in which you live your life. Your outward behavior is dictated by your experiences, what you watch, what you read, and what you listen to. If you spend your days reading romance novels, your view of what real romance and relationships are is going to be skewed. If you listen to the Top 40 radio station all the time, you’re going to begin to define your worldview much the same as it’s told in the songs they play on that station… but you probably won’t be finding God in those songs. 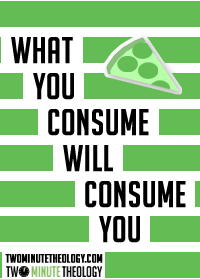 The things we consume, consume us, and we become what we consume. If you spend time with your Father in prayer, and in His Word, then you will find that He just… keeps turning up everywhere. In your thoughts, in your relationships with other people… in the actions that you take, your dreams, and the words that you speak. You are what you eat, and what you consume will consume you. Where does your nourishment come from?